What sets the New Economy apart from the mainstream economy are its ends and means: the goals of the economy, and how it achieves those goals. In the New Economy, the ultimate end is people’s wellbeing and happiness. This goal is the highest and most desirable thing an economy could provide, and it’s what the New Economy is all about. 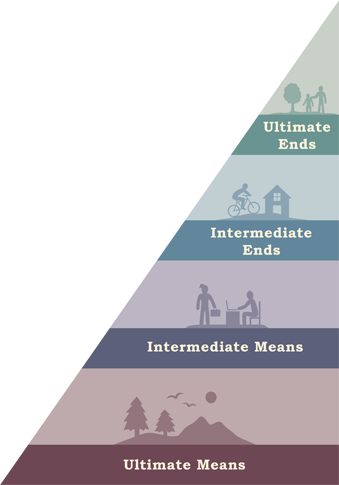 Supporting that ultimate end are the intermediate ends, the tangible goals the New Economy is set to deliver. They include accessible healthcare, quality education, sustainable food and energy systems, and stable employment in green industries. These ends do not guarantee wellbeing or happiness, but they are a path to those ultimate ends. The intermediate means are the productive capacity of the New Economy. They transform and replenish our natural stocks to produce all the goods and services we need. Socially responsible businesses, coops, alternative forms of exchange, and local investment are all New Economy examples of intermediate means. At the base of the New Economy are its ultimate means: a foundation of healthy agricultural and forest lands, wetland ecosystems, and other natural resources that are secured for the long term to provide sustainable economic production. By prioritizing the wellbeing of our communities and environment, the New Economy allows us to develop goods and services that provide for our real needs and help us reach the very top of the pyramid.